Speeding is one of the major killers on Queensland roads. On average 58 people are killed and 295 seriously injured each year on Queensland roads as a result of speed related crashes many of those hospitalised will suffer from the effects of their injuries for the rest of their lives1. ‘Speeding’ doesn’t only refer to driving faster than the posted speed limit. It also means driving too fast for the prevailing conditions without thinking about the vehicle’s condition and capabilities or the driver’s skill and experience. Speeding fatalities and hospitalised casualties in Queensland have an estimated social cost of $612 million each year2. Around half of all serious speeding crashes happen at less than 10km/h above the speed limit3. As your speed increases, so does the distance you travel while processing information and reacting to a hazard. At the same time, the distance needed for you to stop also increases, in both dry and wet conditions. Figure 1 illustrates the combined effects of reaction and braking times in both dry and wet conditions. You can also access this infographic information in text form. is the vehicle’s collision with the object, whether it’s a pole or tree, another vehicle or person. As the vehicle crushes on impact, it absorbs some of the kinetic energy released, but not all. Some of the kinetic energy (energy created by motion) is absorbed by the vehicle (which is why the car is damaged) and some is transferred to the object hit. is the human collision with the inside of the vehicle. At the moment of impact, passengers in the car are still travelling at the vehicle’s pre‐crash speed. When the car comes to a complete stop, the passengers continue to move forward until they come into contact with some part of the vehicle – the windscreen, the steering wheel, the doors or the seat in front. is the ‘internal’ collision of the organs within the human body. Even after the passenger has come to a complete stop within the vehicle, the internal organs are still moving, colliding with other organs and the skeletal system. twenty-seven percent speed in excess of 10km over the limit. Drivers speed for a variety of reasons. One is they feel in control of their vehicle and believe they can set their own speed for the road conditions, regardless of the official limit. Another is drivers don’t monitor their speed – they become distracted and drive over the limit. This behaviour is described by drivers as ‘unintentional’ and is perceived to be relatively harmless. It’s not. Law enforcement strategies are about saving lives. Aside from the tragedy of road deaths, speeding crashes place a high cost on the community each year through hospital and health care costs, lost productivity in the workplace and the use of emergency services. The primary criteria for selecting speed camera sites is in areas where speed related crashes occur or where there is a potential risk of crashes. road funding to improve the safety of the sections of state‐controlled roads where crashes most frequently happen. travel 10km/h faster than the average speed of other traffic, you’re twice as likely to have a serious crash. crash patterns that have occurred. Individual speed limits are frequently reviewed. A speed limit may be changed, and lowered, on a dangerous section of road if it is believed it will help reduce the number of crashes in the area. It is possible to have a speeding crash even when driving within the speed limit. Drivers need to consider the condition of road they are driving on and the vehicle they are driving in, as well as the weather, the light and the traffic on the road. On most trips, speeding will save you very little time. For example, on an average 16.6km commute, you would only save 77 seconds by increasing your average speed from 60km/h to 65km/h. When travelling faster, you use more fuel and your vehicle emits more of the gases that contribute to air pollution. In fact, keeping to the speed limit may actually help with reducing traffic congestion by improving the smoothness of traffic flow through reductions in speed variation and improved distance between cars7. Regularly check your speed to ensure you are travelling within the posted speed limit; most crashes happen at less than 10 kilometres over the speed limit. When slowing down from a higher speed, check your speedometer; it can be hard to accurately judge speed, especially after travelling at a high speed for a period of time. When changing lanes in front of a truck or bus, make sure you leave enough distance between you and the truck or bus, taking into consideration they need significantly longer stopping distances. Leave sufficient distance between you and the vehicle in front of you so you can stop safely; this is usually more than a car length. When travelling at higher speeds, increase the distance between your car and the vehicle ahead (allowing at least 2‐4 seconds) to ensure you have enough time to react and brake to avoid a rear‐end collision. If speeding is a constant problem in your street, you should contact your local police station. The Queensland Police Service has a traffic complaints database that allows them to make informed decisions about enforcement issues. The WTP social cost figures are provided in 2014 dollar value using the 2015 National Guidelines for Transport System Management in Australia. Doecke, S., & Kloeden, C.N. (2014). 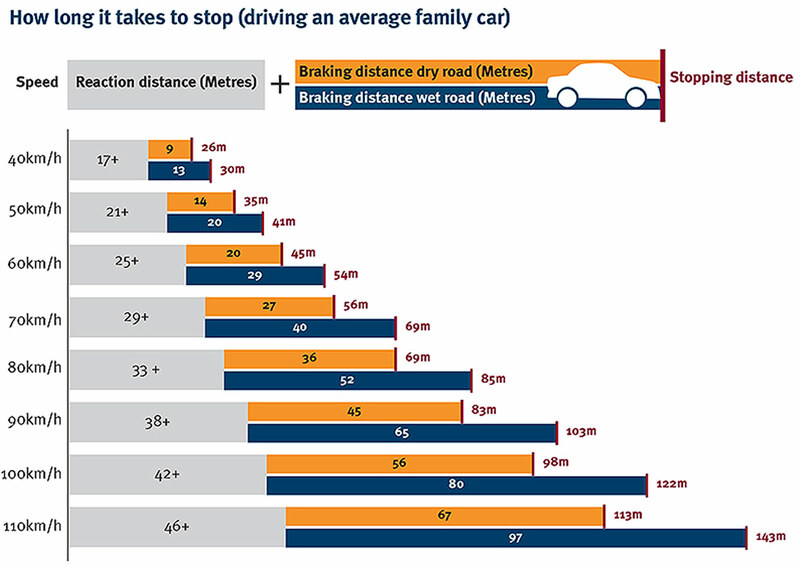 The accuracy of determining speeding directly from mass crash data and using the NSW Centre for Road Safety method. Journal of the Australasian College of Road Safety, 25(1), 35–41. Australian Transport Council. (2008). National Road Safety Action Plan 2009–2010. CARRS‐Q, State of the Road: Speeding Fact Sheet, 2013. Footprints Market Research, Driver Segmentation Research, March 2018. Census of Population and Housing: Commuting to Work, 2016.